Natural Styling Looks Like Real Wood And Foliage. Complete With White LED Lights. Stuff Points: Earn 98 points when you buy this stuff. After a heavy thunderstorm, a weathered branch falls to the ground. Three brown leaves remain intact as it gently rests atop a pile of natural stones. 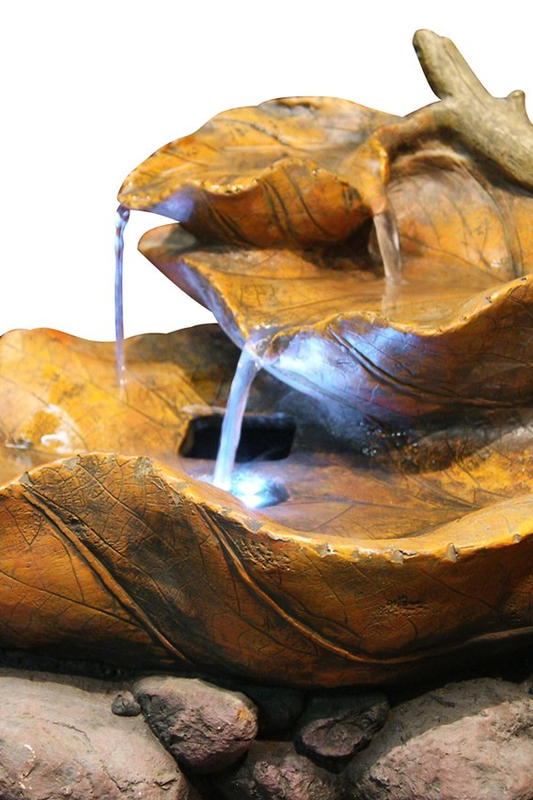 This tabletop water feature can be used inside or out, and although it looks like real wood and rock, it's actually constructed from a fiberglass resin. This lightweight material is incredibly durable, and it's hand finished to give it an authentic, one-of-a-kind look. Water will pump up to the top of the fountain, and then stream downward to the large lower pool that resembles a giant leaf. Two smaller leaves hover above the big one to direct the stream downward. Once one fills, a small waterfall will form, and the water will then flow down, into the next. Once it reaches the large basin at the bottom, and underwater light will cause the water to shimmer and shine to enhance the look. It comes complete with a powerful pump, and long lasting, LED lights, and it works by plugging in to any standard outlet. 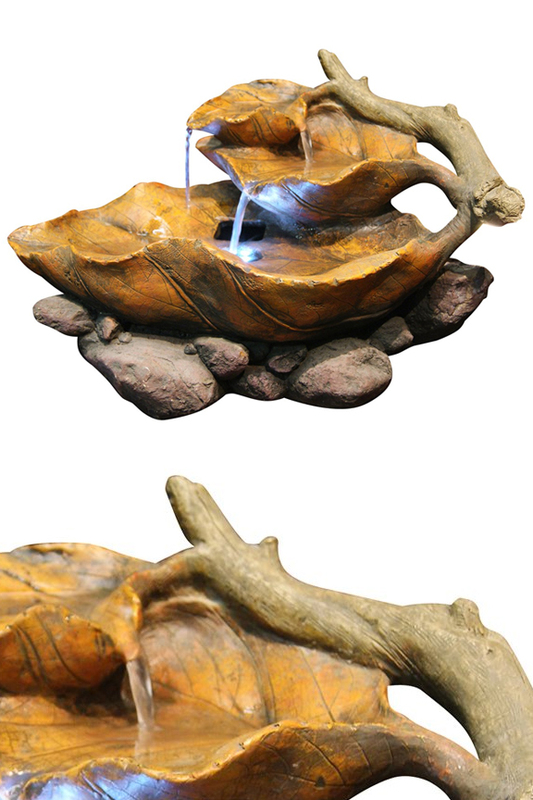 With simple set up, and no plumbing involved, this water feature is easy to install in almost any location. The running water will combine with subtle lighting, and a design inspired by nature to set a relaxing mood. The sound of the running water will diminish unwanted noises, and the visual appeal will create a powerful focal point no matter where you place it. Full Set. This model ships complete with everything you need. The pump, the lights and all other parts are included for a fast and easy set up. Lighted. Bright underwater lights add to the effect, and enhance the visual display. White LED lights provide long lasting illumination that shines upward from deep within the pool. Natural Styling. It looks like a real branch with actual leaves, but it's far more sturdy and long lasting. The fiberglass material provides a natural appearance, but it's far more lightweight and long lasting. High Quality. Intricate detailing makes it look amazing, and top of the line electrical components further enhance the quality. Enjoy proper function and lasting performance. Skillfully Crafted. A well conceived design causes the water to flow nicely. With ideal placement of details and lighting, this model will be a powerful focal point no matter where you place it. Inside or Out. The durable construction is safe for use outside, and will not fade or crack with continued exposure. Thanks to the compact, tabletop design, you can easily use it inside or out. A large fallen leaf rests gently on the ground while two others direct a continuous stream of water into it. With added LED lights to enhance the look. Order Yours Today! A Lighted Waterfall Fountain That Looks Like Natural Wood And Real Stones. A Pile Of Rounded Stones Creates A Three Level Water Feature. Bright halogen light with multiple lenses for intense, solid color. Natural mist production to beutify, humidify, purify or deodorize.